Well...I had the most relaxing Christmas holiday with my family. Oh, there was the one little mishap with the day-after realization that my 10-year old son ate every single speck of chocolate and candy that was in his Christmas stocking and various gifts (at least a 2-3 month supply). We sat down last night for a 'sugarholics anonymous' discussion. And now he's on detox. Which means I have to be on detox to set the example. Really? Did I sign this contract when I became a mother? Anyway, relaxing for the holidays also meant that I was away from 1) the computer, and 2) blogging. So while it's been a bit quiet around here this past week, it's time to hop back on the train and head straight towards the new year! 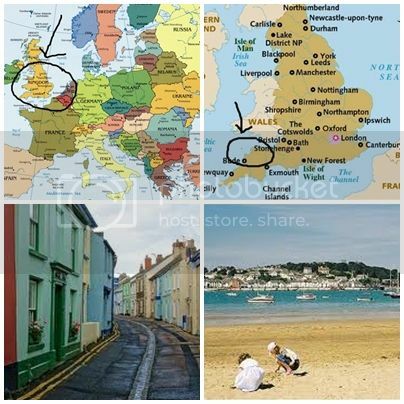 And it's time for our weekly peek at a fellow creative in the European pitstop of the Creating Success Around the Globe blog hop. Josie: I was born with the passion for making things, one of six children living in the countryside we made all our presents and cards using anything we could find. We picked wild flowers and made posies for our mother at Easter and Mother's Day, and Christmas wreaths with holly and ivy, which I still do today. I carried on crafting with my own children - we always had an ongoing project on one end of the table and had to eat our meals at the other end. BVC: Do you have a 'day job'? 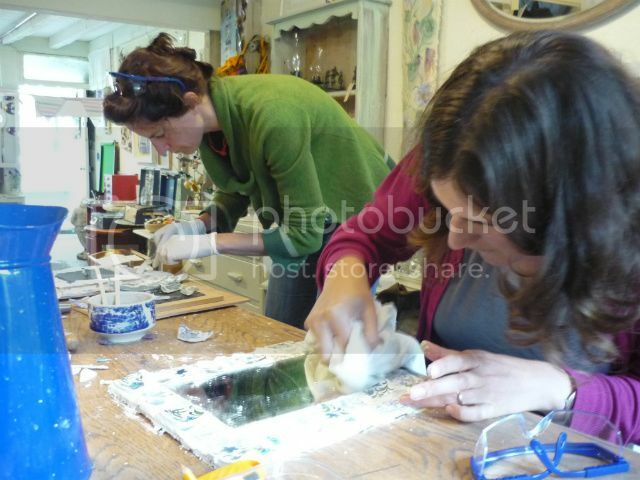 Josie: My three daughters have all left home now, so last February I took a risk and mortgaged my house to buy my little shop and craft workshop in Appledore "SEA GREEN of APPLEDORE" where I make nearly everything myself from recycled materials. It's my only income and I've managed to pay all my bills since then and even afford a bargain inspirational trip to Barcelona. Only two months to go and I will have proved that you can make a living out of craft. I have worked with children doing crafts, and I've also used craft as a therapy for elderly people, adults with learning disabilities and in hospices. I've had stalls in craft fairs and markets selling my creations. Josie: I don't sell online because I can't face all the administration involved with online orders. Josie: I don't think England has a very strong craft/recycle network, but I do feel that it is now growing and expanding fast. 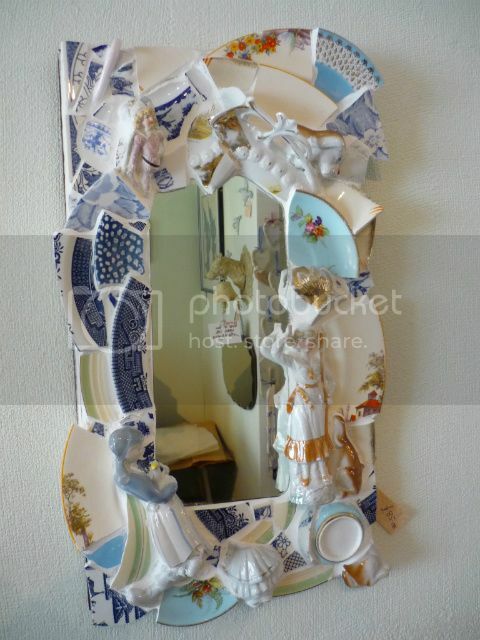 The people who come to my workshops are very keen, and in these hard times are seeing the sense in reusing things. Josie: I'm now living my dream project - I don't want it to expand into something else. I think a lot of people get caught up in this trap and then realize that they didn't recognize the dream when they had it. Josie: ...do what I can't resist on any of my foreign adventures, head for the back streets. That's where you find treasures. Away from the tourists I find pokey little antique and retro shops, small galleries and workshops, and unusual eating places. And of course I meet real people. How great to meet someone that is living their creative dream - and showing that the bills can be paid at the same time! Thank you, Josie, for sharing your thoughts - and for letting us know that we aren't the only ones out there with projects on one end of the table, and dinner on the other. LOVE her work....so imaginative and beautiful! 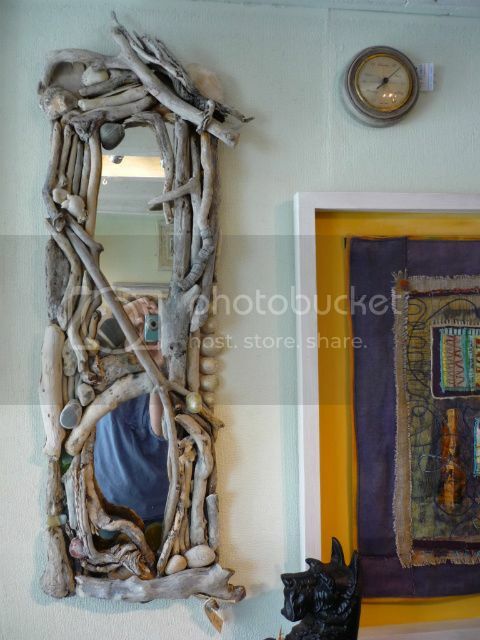 That driftwood mirror ROCKS! This summer I found a never been used, still new in its box, Barbie Mix n' Magic Kitchen. Well, that little nugget of happiness was stored in the back of my closet. Fast forward to Chrismas morning and imagine the utter JOY expressed by my 7 year old for her new and amazing Kitchen. We mixed...we made magic...we ate the amazing brownies that were produced....we then noticed the expiration date of 2005!